Step 2: Glue penguin belly to bag on the side where the flap opens. Glue white eyes to flap. Glue black eyeballs onto eyes. Glue wings to either side of belly and glue feet. 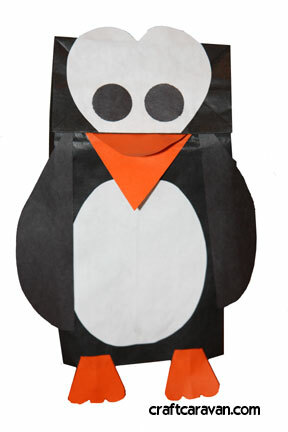 Step 4: Make penguin beak: Lift flap of bag and add glue to the underside of flap, on top and bottom. Push folded end of penguin beak into glued area of flap and squeeze flap together so mouth is firmly pressed onto puppet. Let your craft dry. I live in Vancouver, which gets relatively little snow in the winter compared to the rest of Canada (sometimes none!). So, when the great outdoors get a little snowy, the kids get a little crazy with excitement. Our back yard is currently coated in a blanket of snow, but snow is always short-lived here, so it likely won’t last much longer. Here’s a list of five (actually six!) craft supply ideas for snow-themed crafts, so we can make our snow days last a little longer when the rain decides to wash the real snow away. The classic craft supplies for winter themed crafts. Cotton balls already look like a snowball, so all the kids need is a little glue and a piece of paper so that they can create snowmen, snow forts, and other snowy day pictures. Ripping the cotton balls up into smaller pieces is a fun tactile activity that creates whisps of snow or snowbanks. Put your paper recycling to work by running old bills and statements through the shredder to create long strings of snow. Tear, rip or crumple paper shred into snowy scenes or 3-D forts. Use a sprinkling of white paper confetti to make a blizzard. A blizzard looks especially intriguing if it’s created on black paper with white pencil crayon or crayon drawings, and lots of paper confetti. The kitchen is overflowing with various items that can be used to create a lovely snowy scene. Use flour or icing sugar for a dusting of snow, sugar cubes to create 3-dimensional snow projects such as igloos or snow forts, shredded coconut for larger snowflakes, and whipped cream for a big dump of snow! Most of these ingredients could be integrated into a baking project too – make Gingerbread with a dusting of icing sugar, and serve with whipped cream and a sprinkling of coconut. Wouldn’t that be great after a big play outside in the snow?